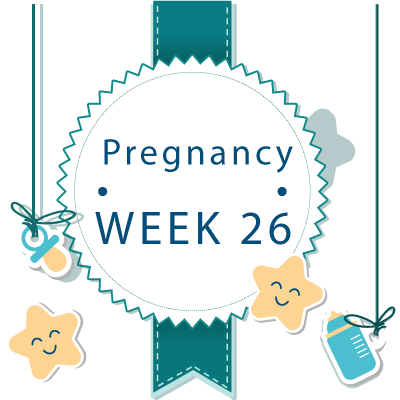 WEEK 26: Watch Out – your Baby now can hear! Even though you haven’t met your baby yet, one thing is for sure—they are taking over your entire life such as playing games with your memory and interfering with your sleep. Brace yourself because these are some of the many issues that don’t just stop at birth, but continue after your baby is born too! You should be mentally prepared as well for your newborn to become the highlight of your attention, and good news is that your little munchkin has already got you practicing in this department. Your baby when your 26 weeks pregnant is about the size of a lettuce or head of kale, and is now developing features, senses and even talents! Most of the symptoms you experience when you’re 26 weeks pregnant are basically discomforts. Unfortunately, as your baby grows, these are just going to get more uncomfortable in order to prep your body for these changes. This is one of the few symptoms that you may have been experiencing in the recent weeks of your pregnancy, and it may beharder to get some rest as you near your due date. Although there is no one size fits all solution for it, try and curb your caffeine intake, get a little exercise and most importantly stay well hydrated. The reason your headaches come and go is due to fluctuating hormones, but may also be caused if you’re dehydrated or hungry. So continue eating small meals at regularly intervals all through the day and frequently drink water. The puffiness may be a little bothersome, but is normal starting week 25 of your pregnancy. However, if the swelling gets severe or sudden, get in touch with your OB immediately as it may be a sign of preeclampsia. You may often find yourself forgetting things, which may be a physiological effect of hormone fluctuations or simply that you’ve got a lot on your mind. A slight surge in your blood pressure is considered perfectly normal at this stage of your pregnancy. But if your doctor notices that its getting out of control, they may classify it as hypertension and administer the necessary treatment right away. You may feel your belly getting tight every now so often, which is known as a contraction. Although you may have felt these in the previous weeks, they are likely to get stronger starting when you’re 26 weeks pregnant. They can be ignored is they aren’t steady or severe, but get in touch with your doctor if they are painful and do not show any sign of stopping. You’ve probably gained approximately between 16 and 22 lbs by the time you’re 26 weeks pregnant, which is completely normal and expected. If you’re expecting twins, expect your weight gain to be in the ballpark of 28 and 42 lbs. Your uterus at 26 week is probably now located around 2.5 inches around your belly button. In terms of your belly, it will continue to grow at the rate of half an inch per week for the remainder of your pregnancy. Maintaining a good posture and avoiding activities that require you to bend and twist at the same time should give you some relaxation. 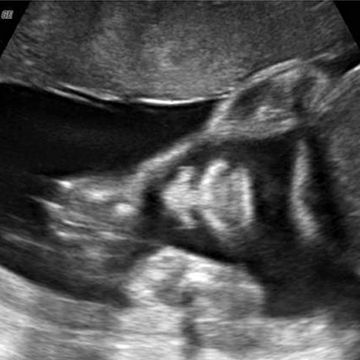 26th Week Pregnant Ultrasound - What to Expect ? Your baby is taking great strides in terms of development and is breathing in amniotic fluid. This is the best time if you haven’t done so already to make a birth plan. This basically describes how you’d like your pregnancy to be handled and to discuss the best options with your OB or midwife. 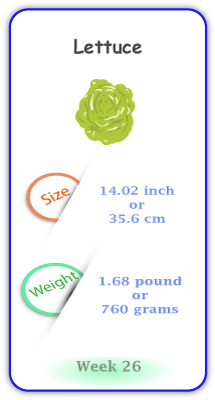 Your baby when you’re 26 weeks pregnant weighs approximately 1.68 lbs and measures 14.02 inches, so about the length of a scallion from head to heel. Your baby’s ears are quite developed so much so that they can hear your voice when you chat with those around you. Further, they are inhaling small amounts of amniotic fluids, which is crucial for the development of their lungs. And will fill air once your baby takes their first breath after birth. Other noteworthy developments in week 26 include nostrils beginning to open, mouth and lips becoming more sensitive and taste buds fully developed.